I welcome you from Russia! Many thanks for your site! You have done deep research into 70mm films. It is of interest for all film fans and figures of cinema of the world. It would be desirable to bring and the mite in the list the 70mm films. Having read through a site, I have not found any 70mm films which have been demonstrated in the USSR. Especially, it represents the big interest as many of these 70mm films have been only demonstrated in the USSR and nowhere in the world! Certainly, it is a question only of foreign films as in Soviet Union it has been demonstrated about 150 Soviet 70mm films, and the majority of them have been really shot in 70mm format. I have also this list near at hand, but it is too large and if it is represent for you interest I shall send it. All 70mm films in territory of the USSR were distributed by huge amount of copies. These films went not only in Moscow, and on all USSR, including Soviet Republics (in the present moment already separate countries), such as Ukraine, Belarus, Baltic Countries, Moldova and others. It was blockbuster № 1, assembling decent money. Beginning somewhere from middle 70-th, in advertising these films the accent was not done that they are demonstrated in 70mm format. The information on it could be learned only in the advertising film-rolling editions and considerably less often on the posters of cinemas. There was such, that about the fact of display of film in 70mm it was possible to learn only by coming on viewing in a cinema. Earlier ticket on 70mm film cost was usually more expensive, but somewhere from middle 70-th (and may be earlier) the price have equated to usual 35mm to films. Last films shown in territory of the USSR in 70 mm format were "Gone with the Wind" (1939) & "Stalingrad" (1989). It was in 1990. On your site I have found pair discrepancies. Here on this page Russian film “Poema o more” (Russian transcription) has not been shot in 70mm format and never demonstrated in the USSR in this format. The first Soviet 70mm film was “Povest Plamennykh Let”. It has been firstly demonstrated in 1961. I pay your attention for the fact, that film “Solyaris” was not 70mm film and never demonstrated in the USSR in 70mm format. Only on the page I for the first time have learned that “Solyaris” demonstrated in 70mm format in Mexico. This film was shot in 35mm format. In the present moment in Russia there are 5 cinemas IMAX (two of them are in Moscow). Also it is unique places, where it is possible to look cinema in the large format. I have no information about advertising of 70mm films. To be honest, it was not exist at that time. Well unless except for a beginning 60-th, when this format only has appeared in the Soviet Union. At us at all it was not accepted to use the term "70mm". Instead of it the term "wide-frame film" was used. The term "wide-screen" was applied to 35mm anamorphic of the image. About any "mm" in advertising nothing wrote, for the majority of the spectators it would be not clear. Films demonstrated in 70mm, by our advertise makers practically was not used. The people without that went in cinema and on good film not so it was simple to get the tickets per the first weeks of demonstration, it was necessary to defend huge turn or to make the advanced orders. By the way, it also concerns films from my first letter. They had enormous success. At us till now sellers DVD put the most famous 70mm films as "Race for the Yankee Zephyr" or "Concorde Affaire' 79" on the most outstanding place on a counter or trade stand, as they are in demand. Though, as far as I know, in West these films for a long time are forgotten. 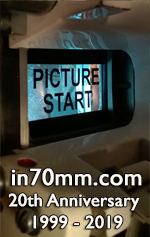 All films, listed by you on page Sovscope 70 really demonstrated in 70mm format. The only films "Poema o more" and "Solyaris" did not demonstrated in 70mm. These films were demonstrated only in 35mm. Also, In me causes suspicion presence in this list of such pictures as "Film Concert" (1940) and "Robinson Crusoe" (1946), as 70mm film and cine camera for manufacture 3D Stereokino at us started to use at the end of the 60-th years. And I now I cannot exact tell, whether reproduced these films in 70mm. I have large reliance, which is not present. Also I want to note, that the list of 70mm of films on this page not complete. In the Soviet Union in the period with 1961 for 1990 was issued of the order of 150-180 Soviet 70mm films. The list of these films at me is. But I cannot tell precisely, what from these films were removed on 70mm negative film, and what were blow-up. Precisely I know, that the system "blow-up in 70mm" has appeared at us in 1974. But despite of it, majority of the Soviet 70mm films were removed on 70mm negative film. Unfortunately, their site from the date of opening was not updated and link on the catalogue of domestic films does not work. Try to make inquiry about them by e-mail. I shall note, that this list incomplete. It will be collected about 15-20 70 mm films more. I have mentioned those films for which I personally warrant.